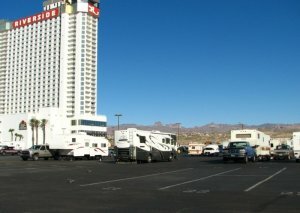 This is a very nice RV park, with lots of large, roomy spaces. They get very busy in the winter time, so you need to book in advance and request a site specific to your needs. Rates are reasonable. Casino is a short walk across the street. The machines are fairly tight, as they are all through Laughlin. Not like Las Vegas casinos. The poker room is fun, with free entries to a morning tournament earned when you get a full house in a cash game. Plenty of action for hold-em and Omaha. Restaurants are adequate but not great. Very nice sitting overlooking the Colorado river while you dine. Some interesting day-trips, like Hoover dam, ghost towns and the like. Nice place to spend a week or so, more than that, you'd better like sitting around in your lawn chair. We've always found it to be dry and windy (read dusty) especially high up on the RV park hill. Never seems to rain.